As a lifelong avid golfer, Val Weis has enjoyed her share of triumphs and tragedies in this grand pursuit. Val and her husband Mike came to a school with us in March of this year, and her principal goals were to hit her irons, with more distance and accuracy. 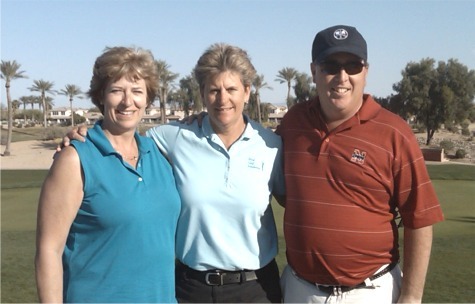 They worked with one of Bird Golf’s Senior West Coast instructors, and teacher extraordinaire, Shirley Furlong. Val has played golf for most of her life and is a good golfer, having a low round of 74 and an 8 handicap. Val’s game, by her own admission, “plateaued” and she knew that she had to make some changes to her swing for her to realize her full potential. A point of note here should be that it is much harder for someone like Val to make changes than it is for a beginner to learn from scratch. Val is a superb student and during the three days that she spent with Shirley wholeheartedly made the commitment to do what Shirley asked of her. With her old swing, Val used her arms too much and lost a great deal of power because she did not involve her body during her swing. Her lack of rotation caused her to “steer” or “guide” the ball rather than swing at it. The improvements that Val made were dramatic and even more importantly, Val has stuck to them. Last Thursday, playing on her home course, Echo Valley Country Club in Norwalk, Iowa, Val realized the fruits of her labor. 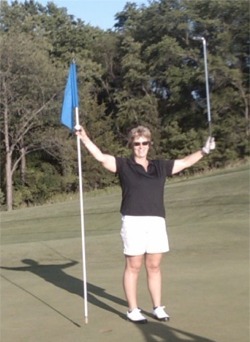 On the 139 yard, 3rd hole of the Ridge course, using a 5 iron, Val made the most treasured of all golf shots; a hole in one. This was Val’s first ever “ace”, but we are certain that it won’t be her last. Making the occasion even more special was that Val was playing with her husband, Mike and her sister, Virginia Cox and her brother, Robert Mauer, who were able to share the absolute triumph of her wonderful moment. True to Val’s tenacity and spirit, she is already looking for her 2nd hole-in-one! Congratulations, Val, and keep up the great work!